Today I accomplished something I wasn't sure I'd ever have the courage to do. I went bungee jumping. It was part of a day trip put on by Adventure Korea. We went whitewater rafting in the morning. For many of my friends, that was an adventure in itself. However, I'm a bit spoiled. I grew up in Montana where the primary recreational bodies of water were rivers, so I've been riding rafts down rivers at various speeds since I was big enough to hold a paddle. This particular day, we were outfitted for a full whitewater adventure-- complete with helmets and the awkward lifejackets that come with straps to loop between your legs. However, the rainy season hasn't started yet and the river was quite low, so we spent most of the time bouncing up and down on our raft to unstick ourselves from submerged boulders. Had it been a raft trip in Montana, we would have been loafing about in our swimsuits while drinking and taking naps on the boat. We did take a fun pit stop to do some minor cliff jumping. Due to a family history of severely breaking bones from jumping off cliffs into unsuspectingly shallow water (cough cough dad cough) I allowed several people to go in front of me before I took the plunge. This jump was only about fifteen feet, and yet as I stood at the top of the rock, I hesitated for a moment. I don't care how brave you are; when you're contemplating jumping off a high point, your very basic animal instincts to not die kick in, and suddenly a paltry 15 foot jump becomes a terrifying plunge to your death. Still, knowing what I was facing later in the day, I forced myself off the edge. Obviously, it was a pleasant little leap and I lived to tell the tale. Eventually, we got back on the river and floated (ahem, sorry, rafted) the rest of the way to the takeout point. We ate lunch there, changed out of our damp clothes, and hopped on the bus to head to the bungee jumping point. As soon as I got on the bus, my stomach started to clench. I kept thinking about the moment on the rock earlier, and wondering how on earth I was going to be able to hurl myself off a 180-foot drop. When we got there, we had to pay up and get weighed. Apparently they sort you into weight classes and that determines which bungee rope (band? cord?) you get. Then it was time to climb the stairs. Several flights of tight, metal spiral stairs later, and we arrived here. There was no turning back now. The people strapped us into our ankle harnesses and led us out onto the platform. Much to my chagrin, I was one of the last people in line. They sorted us by who needed which bungee, so all the "red bungees" went, then all the "blue bungees" went. Because I'm a midget, I was assigned to the yellow bungee. I was not pleased about this because I was the only person who got the yellow bungee, so I didn't get to have the reassurance of watching other people use it and, you know, not die in the process. I passed the time by staring straight down at the drop, trying to get as acclimated to looking at it as possible. Finally, my moment came. With shaky steps I approached the end of the platform and the guy hooked me up to the bungee. What followed was the most terrifying ten (or possibly 2, or possibly 1000) seconds of my entire life. No matter how much you psych yourself up for it, no matter how many people you watch jump before you, no matter how much time you spend staring down at the air below you, nothing prepares you for the moment when you're standing barefoot on the edge of a platform almost 200 feet in the air, so close to the edge that your toes are hanging off. I had told myself that I wouldn't linger. I wouldn't stand there to think about it. I would just take a deep breath and go. I wish I could say with certainty that that is what happened, but to be honest, I don't quite know. One moment I was standing there contemplating the air below and around me, and the next moment I was in it, plummeting through space and frantically bicycle pedaling my legs into nothingness. I don't remember stepping off the edge. I can't even tell you if the workers gave me a countdown. I think I was screaming. I'm not sure. There were no thoughts in my head, only pure, animalistic terror. Then, as fast as my free-fall began, it was over. 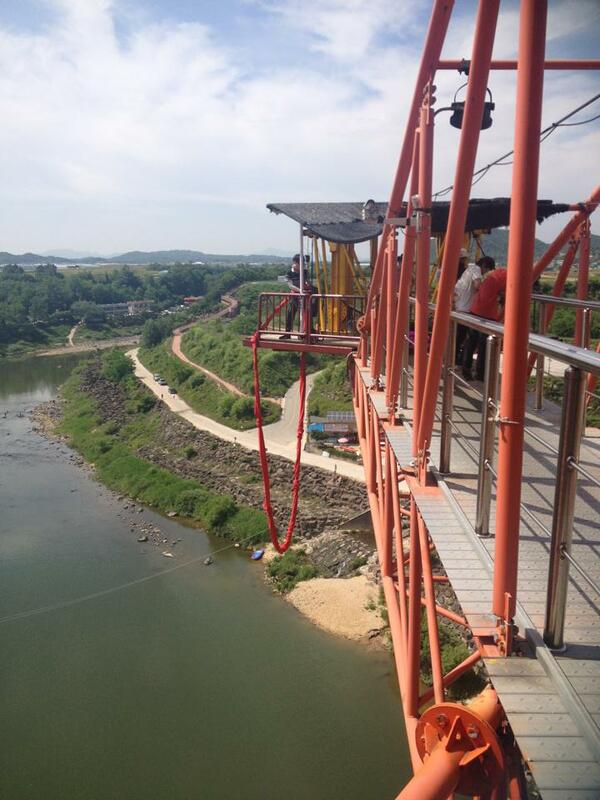 The bungee caught me, I abruptly flipped upside down (being strapped in by my ankles) and started bouncing. And we're not talking little bounces. 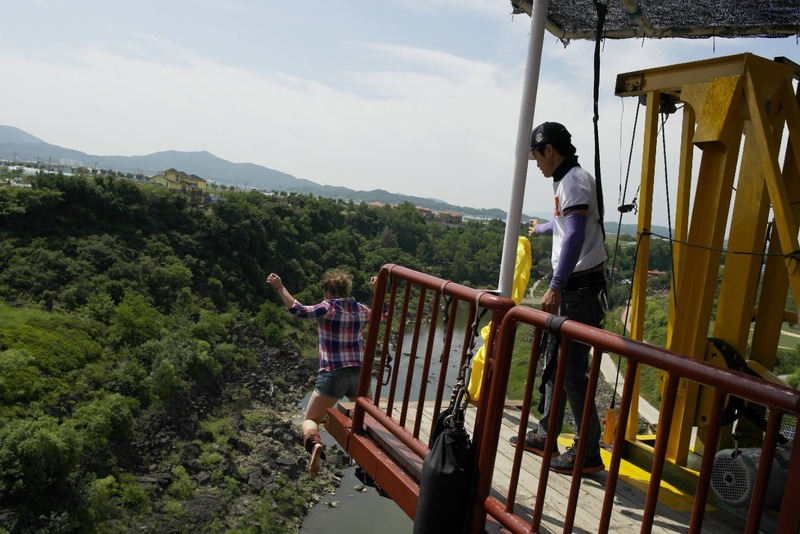 If you've seen videos of bungee jumping, you know that the first bounce brings you almost all the way back up to where you started. But the fear was over. A sense of calm came over me. I stopped screaming, stopped moving, and stopped fighting. I just relaxed and reached my arms out like a bird. I was flying. The bounces turned into slow swings back and forth across the river, at times bringing me almost parallel to the ground. After a few moments, those slowed and I was able to grab the hand of the man in the rowboat whose job it was to retrieve the jumpers. 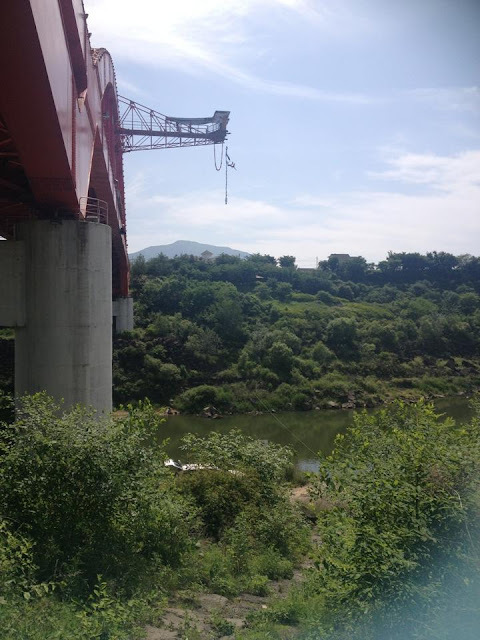 The workers on the platform lowered the bungee until I touched the bottom of the boat, my rescuer pulled me in and unhooked me... and it was over. Here's the video of my jump, courtesy of my lovely friend Regan. As I approach my ten month anniversary of living in Korea and prepare to bring this chapter of my life to a close, I find myself looking back on my time here and what I've learned about myself. I've learned a lot of things. Some are good, and some are bad. But at least today, one day in my life, I can say I was fearless.